"He was the sunshine of our home. To name him was to praise." This is a nice example of a draped pedestal tombstone with a vaulted roof. It can be found in Waverly Hall Cemetery; Harris County, Georgia. This is William B. Marshall, son of James Flournoy Marshall and Rachel Anderson (nee Meacham) Marshall - and he was a distant relative (half-first cousin, 3X removed, to be exact). I have more information on some members of the Marshall family buried in the Waverly Hall Cemetery which I'll be glad to share if it would be helpful to anyone. I'm trying to verify if I'm related to William Blount Marshall. My grand father was William Douglas Marshall and his father was John William Marshall. 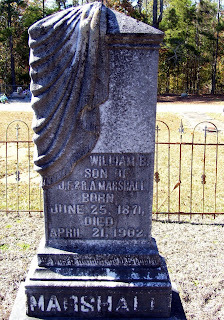 John William Marshall was born in 1865 possibly in Meriwether county. Do you have any clues if we may be related to William Blount Marshall?